Tancredi is a serious opera, which means that at its heart lies a dilemma. In this case, the heroine, Amenaïde, has unwisely written a love letter without naming the addressee. For reasons never made clear (perhaps they were clearer in the Voltaire tragedy on which the libretto was based), the messenger with the letter has been slain by one of Amenaïde’s suitors, Orbezzano, who has found the letter. She must have written it to one of her three suitors but, to the confusion of modern audiences, none of them is a tenor. We’ve come to expect a soprano’s lover will be the tenor. Her true love can’t be Orbezzano because he’s a bass. He accuses her of writing to Solamir, the Muslim currently besieging Christian Syracuse, their hometown, but we know it’s not him since he never appears on stage or in the cast list. And Tancredi is sung by a trouser mezzo. Tancredi premiered in Venice in 1813. After years and years of endless, relentless struggle, at the nearly decrepit age of twenty-one, Gioachino Rossini finally achieved howling success: Tancredi, in February, and L’Italiana in Algeri, a heroic farce, the following May, made him the talk (or hum) (or whistle) of Italy. His feat was matched that same year, a little more sedately, by a composer of the older generation, Simone Mayr, Bavarian-born but Bergamo-domiciled, whose La Rosa rossa e la Rosa bianca appeared in Genoa in March, his Medea in Corinto in Naples in May. 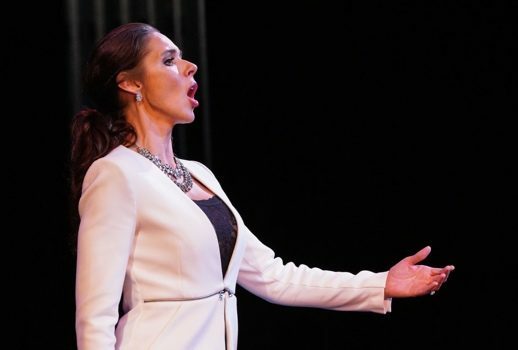 Teatro Nuovo, the bel canto festival newly established at Purchase by Will Crutchfield, saluted “The Dawn of Romantic Opera” with Tancredi last Saturday night, Medea in Corinto on Sunday; each to be repeated next weekend. There will also be an alternative Tancredi “Rifatto” (re-made), replacing half a dozen numbers with alternate versions composed by Rossini for revivals with different singers. Teatro Nuovo will use a different cast of singers as well. Teatro Nuovo, presented at the arts center of SUNY Purchase in White Plains, replaces the bel canto program Crutchfield led for the past 20 summers at Caramoor. The theater at Purchase, where PepsiCo held a summer opera festival in ages past, is spacious and, best of all, indoors and air conditioned. Too, it is barely an hour from the city. As a trade-off, we lose the splendor of Caramoor’s Venetian gardens, picnic areas and labyrinthine walks. Instead of a very long day in the country, we have a casual evening in a theater. The first performances were sparsely attended, perhaps because the weekend coincided with concert events elsewhere. Tancredi, beloved in its day, is rare nowadays, though Marilyn Horne sang it all over the place (twice at Carnegie Hall), in concert or staged, and Ewa Podles has taken up the cudgels in both Boston and Philadelphia. The late Philip Gossett, in Divas and Scholars,describes his long search and happy discovery of the lost “tragic” ending of the opera (one of Rossini’s second thoughts that did not find popular favor), and there was some dramatic tension on Saturday as we tried to remember which conclusion we were going to get. As there isn’t much tension in the plot (“Just tell them you wrote to Tancredi!”), that uncertainty provided a welcome frisson. The occasion was bounteous for anyone who likes plummy coloratura mezzos. Besides Tamara Mumford, who graced the warrior title role in slim trousers and very high heels, both she and Amenaïde had confidantes (you can’t sing an opera seria without confidantes; in operas yet to be written, such roles will be taken by Siri), and these figures, either female (Isaura) or male (Roggiero), were sung by mezzos, each of whom had an aria—often cut, no doubt, in repertory performance—but not at Teatro Nuovo. Mumford, who thrilled us all in L’amour de loin at the Met last season, admirably played the sturdy, humorless hero around whom the plot swirls, her suave voice running up and down the scale without a break, providing pleasure but without the startling enthusiasm more spectacular stars have brought to this role. Tancredi hasn’t much personality; it is up to the singer to fill his heroic vacancy. Hannah Ludwig sang Isaura, the confidante as tower of strength, with an ample reserve one could easily imagine developing into an Amneris. Stephanie Sanchez, the Roggiero, less forceful, had a cleaner, fresher sound. The most difficult role in the opera, however, belongs to Amenaïde, the focus of all the attention. Amanda Woodbury, a much-heralded young coloratura, gave the most interesting performance of the evening. The voice is strong and attractive, with a fine trill and a ravishing swell, both building and fading. Even more charming than her well-ornamented cabalettas was the passion she brought to dramatic recitative, telling us a great deal with musicality and economy. Too, her voice blended in duet with Mumford’s as ravishingly as any such bel canto pairing. What I hope she will work on is a clean bel canto glide from her sizable chest voice to the highest extension, exactly the place where Angela Meade goes wrong. I look forward to hearing Woodbury in roles like Semiramide and Verdi’s Hélène. There is a virtuoso tenor in this opera, Argirio, Amenaïde’s bewildered father, and Rossini gives him two arias (as well as alternates that will be heard in Tancredi Rifatto) of contrasting feeling and showmanship. He was sung by Santiago Ballerini, Donizetti’s Fernand and Bellini’s Gualtiero for Crutchfield at Caramoor. His is a dark, attractive sound, agile but mushy in the passagework, lacking that extra tinge of dramatic excitement. His Act II showpiece was most appreciatively received. Leo Radosavljevic sang the thankless role of Orbezzano ably enough. The Teatro Nuovo Orchestra includes many original instruments (wooden flutes! antique trombones of different sizes! valveless horns! in Medea, there was even a serpent!) Playing was sometimes just a little ragged and lacking in dramatic energy. Maestro Crutchfield co-conducted from his continuo duties at the keyboard with his first violin, Jakob Lehmann. The orchestra—small for Tancredi and with just a male chorus—only the largest opera houses had a resident female chorus as well in 1813—was arranged in the older fashion, when balance and eye contact were more important than keeping each section in its particular place. This gave way, like elaborate coloratura, as orchestras and opera houses expanded in size and began to play a grander symphonic repertory, but Crutchfield is quite right to suspect that much bel canto charm was sacrificed to size and power.